Out of all the websites in the world, I am so thrilled you landed on my page. Let me introduce myself. I am Erica M. McAfee, a Virginia bred and based Special Needs and Lifestyle blogger, Podcast Host, and Grief & Pregnancy Loss Coach. I am a nerd, Chemical Engineer to be exact, who loves the color Purple, and listening to Podcasts and Audio books. I am a classically trained Violinist who loves all music especially Gospel and anything with an Afro Beat. I am a Special Needs & Disability Advocate, Cerebral Palsy Mom to Super Mighty Max, Pastor's Wife to Brandon O. McAfee (some call me First Lady, but I'm the ONLY lady), and absolute lover of Jesus Christ. I inspire, uplift, and encourage woman who have experienced Miscarriages, Still birth's, Infant losses, and Infertility by giving them the tools they need to become more resilient, confident, and joyful no matter life's challenges, circumstances, and hurts. I also love to engage with those Special Needs and Disabled Moms as we navigate this journey of having a "differently" able child in this able bodied world. As I have personally experienced loss through a miscarriage at 18 weeks and an infant loss at birth (39 weeks 5 days), I want you to know that You Are Not Alone on this grief journey. As a mother who parents a Spastic Quad Cerebral Palsy always smiling toddler boy Super Mighty Max, this journey of Special Needs and Disabled parenting is tough, but You are Not Alone. Join me weekly as I post my journey and experiences of being first a Child of God, an amazing Wife and Special Needs Mom, and helping those who want to share their stories. Short Bio: Erica M. McAfee is the founder of Sisters in Loss, LLC, a faith based Pregnancy Loss Grief Coaching & Doula Service Company that helps women replace silence with storytelling around miscarriage, pregnancy loss, and infertility. Sisters in Loss provides birth and bereavement doula services, infertility and grief coaching services to help women step beyond anxiety and fear and into trust and peace after loss. Erica is a Pregnancy Loss Grief Coach, Birth & Bereavement Doula, Pastor’s Wife, and Mom to two angels in heaven and one rainbow baby Maxwell also known as Super Mighty Max. She is an alumnus of Virginia Commonwealth University (VCU) with a B.S. in Chemical Engineering. Erica M. McAfee is the founder of Sisters in Loss, LLC, a Faith based Grief and Pregnancy Loss coaching company that helps black women turn their pain into their purpose after loss. Sisters in Loss provides birth and bereavement doula services, infertility and grief coaching services to help women step beyond anxiety and fear and into trust and peace after loss. Sisters in Loss goal through courses, retreats, and conferences is to help women Minimize regrets, Maximize memories, and Manage their path forward after loss. It’s self titled podcast spotlights faith filled black women who share miscarriage, infant loss, and infertility stories and testimonies to heal, gain clarity and peace, find hope, and an empowering path forward after loss. 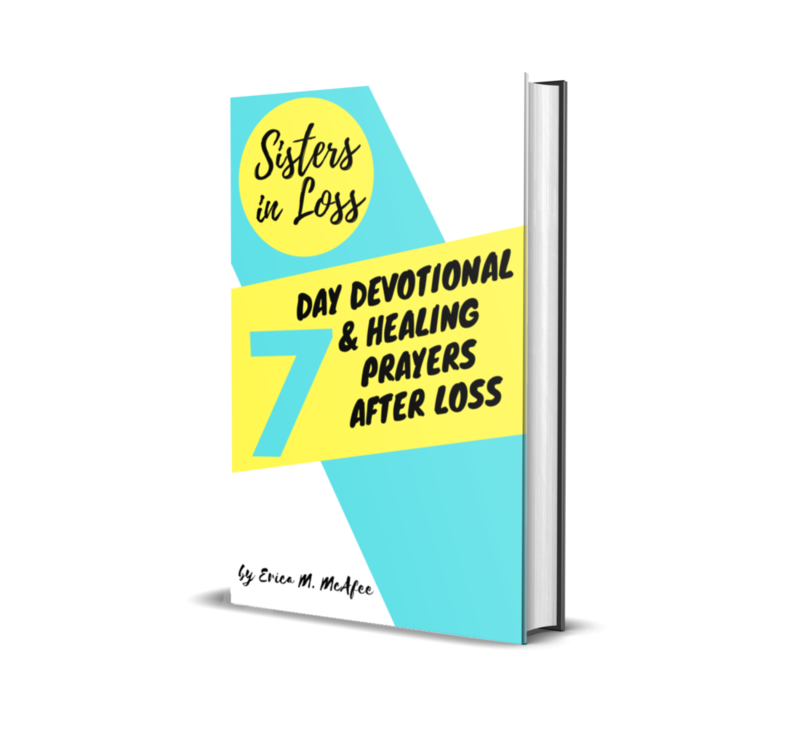 Launched in August 2017 the podcast has a community of 10,000+ sisters in loss. Erica is a Grief and Pregnancy Loss Coach, Pastor’s Wife, and Mom to two angels in heaven and one rainbow baby Maxwell also known as Super Mighty Max. She is an alumnus of Virginia Commonwealth University (VCU) with a B.S. in Chemical Engineering.